More than half of luxury and fashion brands expect their influencer marketing budgets to expand over the next year, legitimizing many predictions of the growing popularity of influencers. Currently, 73 percent of luxury fashion and beauty brands have an active influencer marketing campaign going on and 65 percent agree that it is very effective. 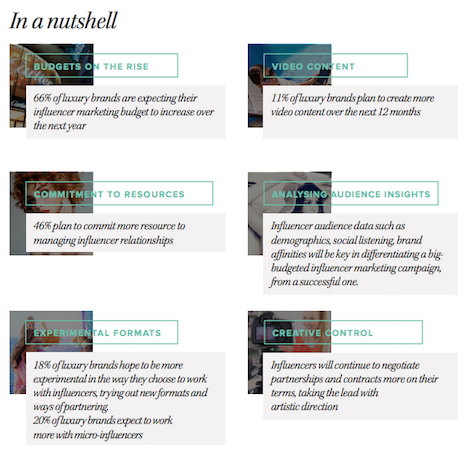 This data comes from Fashion and Beauty Monitor’s report on influencer marketing, "The New Face of Luxury," which analyzes the current view on influencers in the luxury fashion world and established seven major trends in the influencer market. “You really need to understand the influencer and their market to get a meaningful ROI, and we spend most of our time researching and handpicking the right influencers for the brand or campaign," said influencer Robin Shaw at Warm Street. "If an artist already buys into a brand that’s because they respect it, and likewise they want to be respected in the same way." Influencer marketing is a perfect match for luxury fashion. Fashion brands are all about selling a lifestyle and influencers provide the perfect vehicle to put that lifestyle in front of consumers in an accessible and desirable way, leading them toward featured products. The report from Fashion and Beauty Monitor lists seven major trends in the influencer market. These trends are: bigger influencer marketing budgets, analyzing audience insight from influencer campaigns, managing influencer relationships, micro-influencers, new ways of working with influencers, taking creative control from influencers and more video content. Due to the success fashion brands have had with influencers, their use is growing throughout the industry. But there are challenges inherent to using influencers. The number one challenge brands had is finding the right influencer to fit their brand. This could be because almost 80 percent said they were searching for influencers manually, which is a time-consuming process. Many brands have stated that they will devote resources to coming up with better ways of finding the right influencers to work with. 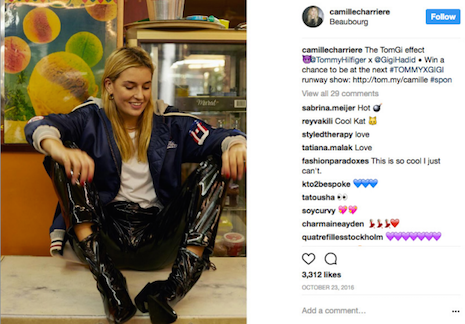 Outside of finding influencers, managing the relationship with them is another challenge that fashion brands are facing. Almost half of all brands surveyed for the report said that they were going to develop improved ways to manage the financial relationship between influencers and brands. Finally, brands are concerned about ceding creative control of how their products are marketed to influencers and want to have more oversight in what influencers post related to their content. In the future, Fashion and Beauty Monitor predicts that more brands will take an active role in shaping the content that influencers produce, rather than giving them free reign to post whatever they want. Influencers are immensely popular in the luxury world and not just in the US and Europe. Luxury brands experimenting with WeChat's commerce model rose from 3 percent to 10 percent from the year-ago, likely attributed to the fact that influencer posts perform 8 times better than branded posts in China. L2’s Digital IQ Index China: Luxury 2017 report looked at different luxury brands and how they are performing in the Chinese market. What the report found was that familiarity with China’s unique digital platforms leads to better performance, particularly when engaging with Chinese influencers on social media. Even outside of fashion, brands are swarming to influencers. Rosewood Hotels is a great example. Overall, the key to making the most of influencers is understanding how they relate to a brand and to the products being sold. “I would hope to see brands being more selective over their influencer choices, working on longer term campaigns that grow as the affiliation between the brand and influencer grows," said London-based influencer Victoria Magrath from InTheFrow, who worked with Fashion and Beauty Monitor on its report. Staff writer at Luxury Daily, New York.